Female house spiders are usually 9-10mm and males are 6-9mm (not including leg span). They are brown and hairy with long legs. Their leg span can get up to 60mm. Male house spiders have a slimmer abdomen and longer legs than female house spiders. 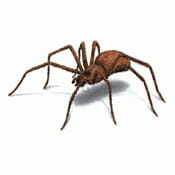 This spider is often mistaken for the Brown Recluse spider. House spiders will often be seen in and around your house and garden. They are seen most commonly in log piles and in garden sheds. They usually eat crawling insects such as beetles, earwigs, and cockroaches although, house spiders have even been observed feeding on earthworms. House spiders can survive for months without any food or water. The house spider stands on top of its sheet-shaped web and waits for insects. Sometimes it will build a tube-shaped retreat where it can hunt in safety. After a male has found a female’s web he will stay with her for some weeks. During this time he will mate with her a few times before eventually dying. The female does not kill the male, but after he dies she does eat him. In this way, the male contributes to the health of his offspring after his death. Males are often found trapped in baths in houses. They fall in after foraging, and can’t get out. Treatment starts with a thorough inspection for the primary source of the infestation and any conducive conditions. After that recommendations are made for good sanitation practices and/or elimination of conducive conditions. Then a pesticide/trapping application maybe preformed when necessary. Chuck Sullivan Exterminators provides an All Pest Service Guarantee so you won’t have to worry about house spiders in your home or commercial building after treatment has been applied.